When building a new home, it’s extremely easy to add a window to your home, even once construction has started. But what if your home is already complete, or even a decade or two old? 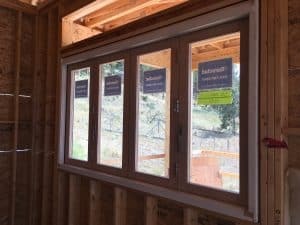 How hard is it to add a new window to a current home? The good news is that adding a window is a relatively uncomplicated process in most cases. Another reason you may want to add a window, or add a larger window, is that your home is a little older and only has a few windows, or the windows you have are smaller, and you’d like to brighten things up. Many older homes were built before many of the new window technologies were available – especially when it comes to glass walls systems and hydraulic server windows. We always recommend consulting with a professional before putting a new hole in your wall to add a window, as there are many factors that will go into whether it’s even feasible to add one. The first factor is what’s inside your walls. Generally speaking, you can solve any problem you find behind your walls and add a window, but there’s always a cost to it. For example, if you find a gas line, central vacuum, electrical wiring, supporting beam, or plumbing, they can all be moved, but some at a larger cost than others. Finding out what’s in your wall may be as invasive and opening the drywall to have a look. The older your home, the more complicated this can be, especially if you’re not the original homeowner. Previous owners may have made their own additions or repairs, and may not have documented them very well, which can lead to surprises. The next step is choosing what type of window you’ll want to install. Features like size, weight, how it opens, whether it will bow out, and the height of the window will all need to be decided first. At Euroclad, we’re a custom window and door manufacturer, so we can pretty much build any type of window to fit your needs. A professional can really help you out when it comes to choosing a window type. Not only are they able to show you different options, they’ll be able to assess your where you’d like to put the window and let you know about any obstacles you may face. Once you know the type of window you’re putting in, it really just comes down to making a hole, and adding the proper support to it. You’ll want to reference specific building codes for your area to make sure you’re following the structural rules and requirements. The larger the window, the more support you’ll need. For small windows, the simple king stud, header and sill plate framing will be enough. The more you increase the size, the more complicated the framing will get, especially when it comes to the header required to support the structure. If adding a window sounds simple, that’s because it really isn’t too difficult. Most of the hard work comes down to the planning and avoiding any surprises that may pop up. If you have any questions about adding a window, drop by our showroom to chat with our experts and we’ll be able to offer you some tips of what you can expect. The best part about owning your home is that you can make the changes you need, and at Euroclad Windows and Doors we want to help you make those changes a reality.